But what does it really take to quit? Certain times of the year tend to be popular for people to quit smoking. Obviously, New Year is tops and after or just before a major holiday. People don’t tend to rush in droves to stop smoking during the summer months, but as soon as the kids go back to school smokers explore giving up cigarettes. Likewise my clinics are bursting at the seams before the holidays but then December it tails off. Of course this is also all true for weight loss clinics as well. So as I write this post I’m currently seeing a lot of smokers who want to quit. But I don’t take on every potential client as no matter what time of the year some people are prepared better that others for the road ahead on quitting. I’ll share with you here how to determine if a smoking cessation program using hypnosis will work for you. If you’re considering hypnosis to help you quit then I’d like to prepare you with the information presented here. 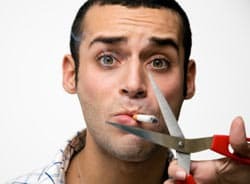 Over the years of my practice there is a pattern I’ve noticed in smokers who had the right approach and attitude going into their the program but also had a plan in place for life after cigarettes. After all most of us can quit anything for one day – but then turn that day into weeks and months and the task isn’t quite so easy. So your intent, commitment, and timing have to be in alignment. Many hypnosis practitioners say all hypnosis is self-hypnosis and this is partly true as a hypnotist I’m there to guide you to the resources you already have to quit. My job is to show you how to access those powerful resources but you are the one that is hypnotized not me. So whether I’m in a face-to-face session with you or you’re listening to me on a CD or MP3 session it doesn’t matter. According to a 2004 Psychology today article about 50% of active smokers attempt to quit each year. Only about 2%-5% are still non-smokers after twelve months and that’s after 5-6 attempts. The reason for this abysmal success rate can be diluted down to one simple predictor of success – having an attitude of being ready to quit. Here are my thoughts on determining if you’re ready to give up cigarettes for good. 1. Are You Quitting for the Right Reasons? If you’re quitting because you “think you should” or because of pressure from family or friends – think again. Smokers who decide to quit because “they want to” for reasons like health or self-esteem have a higher success rate. 3. Are You Under Emotional Distress? Quitting cigarettes can be a stressful time. If you have other emotional distress in your life such as divorce, or employment issues, discuss the timing with a professional hypnotist. A person undergoing a hypnosis session is not asleep; in fact the hypnotist does not want the subject to go to sleep as they’re not as receptive to suggestions in the sleep state. You’ll be completely conscious of what’s going on and what’s being said at all times although you’ll most probably have your eyes closed to avoid distractions. You are always in complete control of your own hypnosis state. The fact is the hypnotist cannot make you do anything you don’t want to do. If a suggestion is made that is unacceptable to you, that suggestion is merely rejected. You should not confuse hypnosis coaching with stage hypnosis for entertainment value. Anybody can be hypnotized as we go in and out of it every day without realizing it. If you’ve ever become absorbed in a movie or book and lost track of time, or driven home on a familiar route and can’t recall most of the drive… then you’ve already been in hypnosis… you just didn’t know it. The danger with this thought is that if you think you can’t be hypnotized then you’ll resist the process and it won’t work. Just be open to the hypnosis process. Again, you’re never under the control of the hypnotist – they’re your guide to access your subconscious resources. You control any hypnosis session as regards your responses. Deep hypnosis is not required for the work hypnotists perform. Unfortunately over the years many hypnotists have felt the need to market themselves as hypnotherapists to separate themselves from hypnotists that focus on entertainment value. As you rightly point out the term “therapist” is usually reserved for someone who helps people with mental issues. While some hypnotists are qualified and licensed to help people with mental issues this is not necessary to help clients quit smoking or lose weight. In these cases it is more accurate to describe the work a hypnotist is providing as coaching rather than therapy. What Will the Private Session be Like? Most hypnotists will perform a phone screening. It’s only fair before you book a private session that you have a chance to learn more about the hypnotist and they have a chance to evaluate whether they can help you, and this is best achieved with a phone discussion. Once I book a session for my own clients I also send them a brief questionnaire to complete and bring with them to save time when they visit. This questionnaire together with the opening discussion provides the materials I need to customize the hypnosis session for their particular needs. A hypnosis session lasts anywhere from 90-minutes to 2-hours. While I offer a backup session if people need it, generally one session is enough. But people always leave with reinforcement CDs to provide support in the critical few weeks after the session. The actual hypnosis session is a relaxing experience. Every hypnotist has their own set of scripts they prefer for their clients, and again tailored for each individual – this is why private sessions are more effective and quicker because they are individually customized in comparison to self-hypnosis CDs or MP3 downloads which are necessarily generic. Suddenly you’re back in the pressures and stress of real life and this is where some struggle. Apart from listening to the reinforcements CDs most hypnotists will provide their client, there are others things you can do to help. Here are 5 tips and strategies to integrate into your life after your hypnosis session. Years of smoking usually damages your overall cardiovascular system which needs repairing. Start out with walking each day for 20 minutes, and increase to longer and brisker walks, and eventually progress to a regular exercise program at a gym or health club. We’re not talking about training for the Olympics here just healthy exercise to fit your capability and lifestyle. Many clients I see are apprehensive about quitting because they’re afraid they’ll gain weight because they’ll fill the void with food. Most smokers who quit will gain about 5Lbs in body weight – this is not unusual and you should not be alarmed if this happens to you. However, you can avoid this gain easily by eating healthy foods in moderate portions and taking in plenty of water. Eat plenty of fruits and vegetables and lean meats, and reduce foods and drinks high in sugar and fat. Remove yourself from friends and family members if and when they smoke. It can be testing on your resolve, especially during the first 6-12 months after you quit, being around somebody when they smoke. I always recommend to a client if their spouse smokes to do a program together for this very reason. Prepare for days or situations where your resolve to stop smoking will be tested to the limit. Write out on a small sheet of paper all the reasons why you’re quitting, such as health, children, money, etc. Be explicit – a little emotion here goes a long way. Carry this paper with you at all times in your wallet or purse, and take it out and review on those occasions when you feel the most vulnerable to lighting up again. I know it sounds a little hokey but it’s something only you need to know about… and it works. As I mentioned in my opening, for some quitting can be a difficult time. So it is fine to do something special for yourself when you reach a milestone, or you’ve got through a particularly difficult day. I’m not suggesting a new car or diamond bracelet, but slipping away to see a movie or a sports game can be both a treat and motivator for remaining smoke free. I hope the information in this article provides you with the knowledge to decide if you’re really ready to quit and if you are then the confidence to take the next step towards quitting. Read more information about my Quit Smoking program in Mashpee here >>>.